As part of a content partnership with Nola Studiola, a collaborative online platform where various artists — visual and literary — curate the site with their own content for month-long “residencies,” we will feature monthly “dispatches” from Nola Studiola’s artists. This feature series focuses on the artists’ reflections of their curatorial work at Nola Studiola. The site’s latest guest curator is New Orleans-based writer, artists and accomplished home cook Carol Pulitzer. For her Studiola curatorship, Pulitzer writes about all three of her passions. 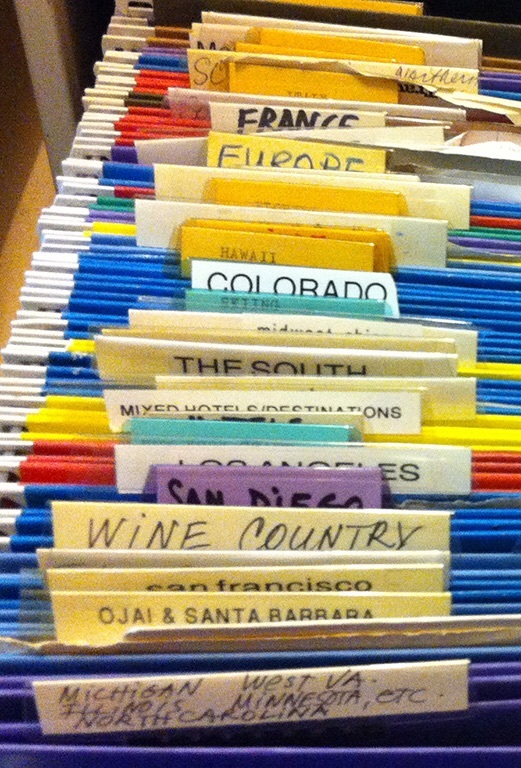 Below, Pulitzer discusses her extensive filing system, which holds each visual and narrative materials she thinks she may later use for a story. 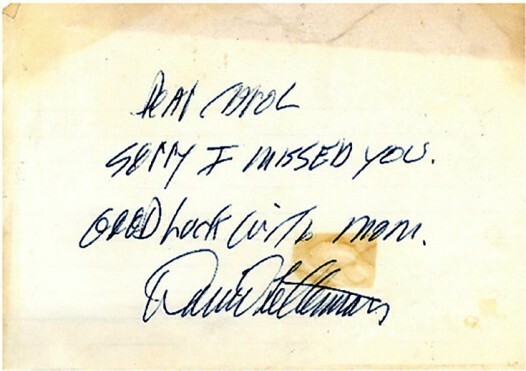 One such item is a letter from David Letterman. Mom and I stood across the street from Trump Tower, two years after it was built wondering who was at the center of the crowd of people out front that included an NBC film crew. Seeing the interior of Trump Tower was on our visitors list, anyway. Later I learned that by breaking the tower up into retail, public, and living space, and claiming the airspace above its neighbor, Tiffany’s, Trump had circumvented building regulations that would have prohibited him from going so high on such a crumb of land. Was he the first one to think of a mixed-use high rise? If he was, this was his stroke of genius..and trickery. Couple that with his schoolgirl vanity and you have a Cyclops missing an eye for introspection. A common brown sparrow, majestically fluffing its feathers oblivious to the fact that it’s not a brilliant blue bird. A hat of hair in all its dandy glory. Mom wasn’t technically a visitor since she and her husband came to New York regularly for business. He sold fur coats in New Orleans, a city where summer can break out in January. I think this explained why he was so grumpy all the time. We crossed Fifth Ave. and there Dave Letterman stood at the center of the crowd taping a bit for his show that night. He’s this! He’s that! I filled her in. She marched directly up to him and said “I don’t know who you are but my daughter thinks you’re wonderful”. Mortified by mom once again, and wishing I was invisible. Next mom and I went to have tea at a hotel trying to be British, two guards standing at attention out front like it was Buckingham Palace complete with gold embroidered scarlet doublets and chin crunching fuzzy bearskin hats. And there was Dave and his crew again. Mom waved assured he remembered her from their get together at Trump Tower. I turned and waited for it to be over. That night I fetched her right on time at 7:30. She was still in her bathrobe putting on makeup. Apparently she had encountered Dave a third time that day after we parted. “Here” she said, “I have something for you.” She handed me a scrap of paper.